Say hello to Zia, Zoho's AI-powered assistant, now for Zoho Desk. 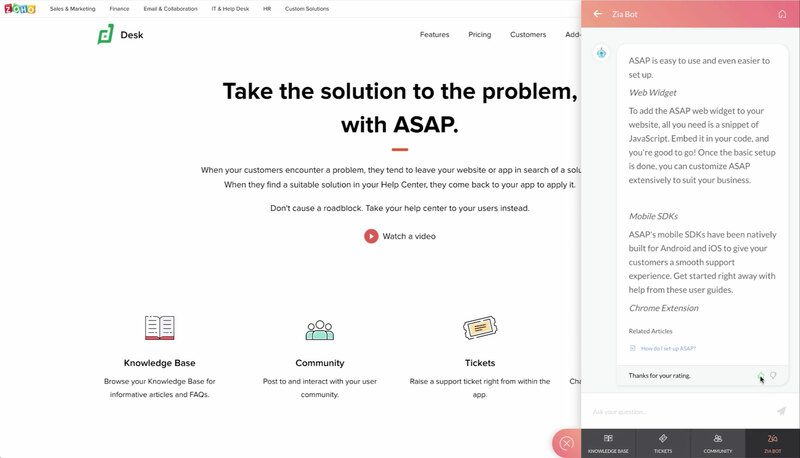 With Zia, you can stay on top of every aspect of your customer service effort. Customers can speak or chat with Zia from your website or mobile apps. 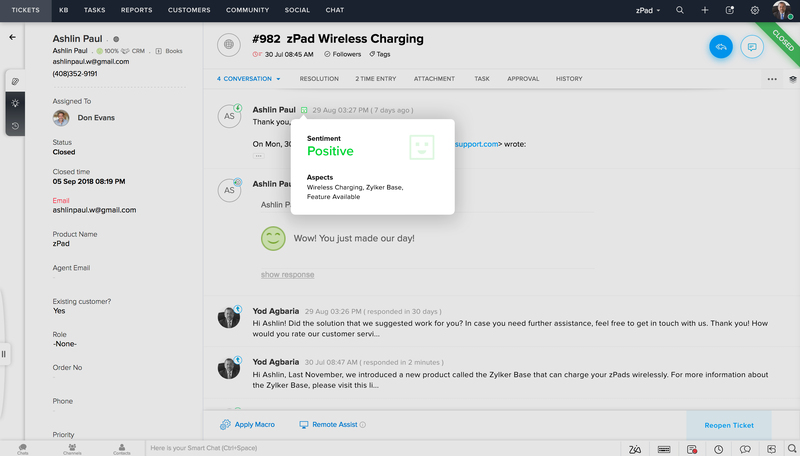 Zia processes their questions and automatically answers them based on content in your knowledge base. Using a skill builder, Zia can also be trained to perform actions for customers like placing or editing an order. 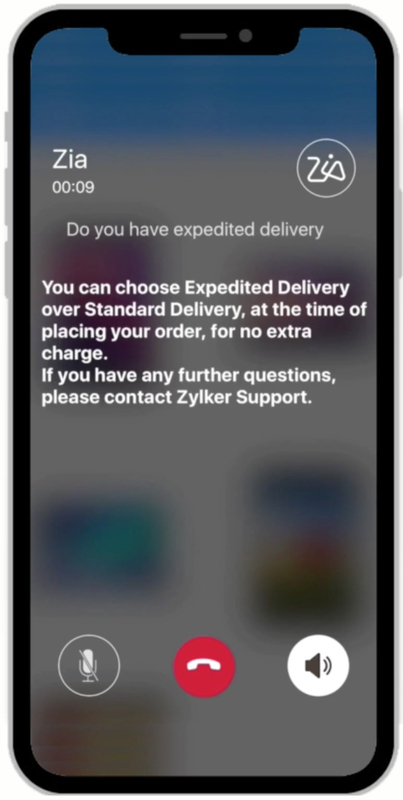 Customers can chat with Zia right from your mobile app or website. Zia processes their questions and suggests appropriate solutions from your Knowledge Base. Zia also notifies your managers about topics for which the solutions weren't helpful, thus ensuring there are no loose ends. Zia reads between the lines. Zia can identify the sentiment behind every ticket that comes in. 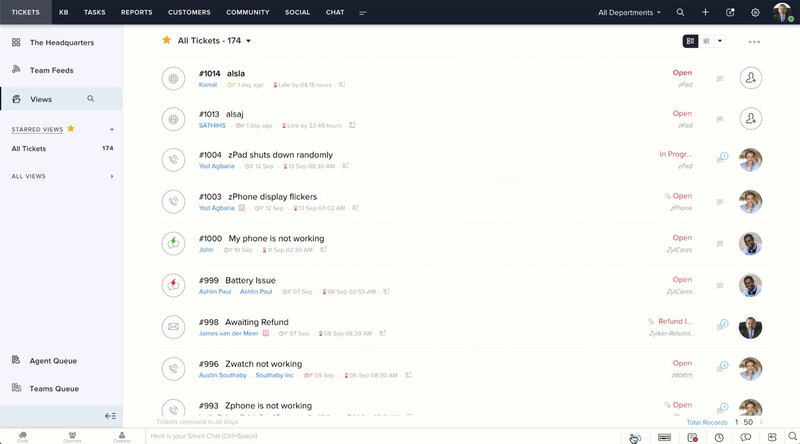 This adds to the context of the ticket, so agents can prioritize and send the best possible response. She even tags what issues might have caused a negative sentiment, so you know what to fix. Zia processes incoming tickets and assigns them appropriate tags. Tags help your agents identify tickets that match their skill sets, and draw on past tickets for reference. When Zia is unsure of what tags to assign a ticket, she asks you. And that's how she learns, so she can help you better the next time. Before an agent can start drafting their response, Zia has one typed out and ready for them. This is based on the content of the ticket and the best match from your Knowledge Base. All it takes is a single click to send this out. Zia analyses and identifies anomalies in your team's performance 24*7. When there's a sudden surge in incoming tickets, Zia warns you so you can get more hands on deck. Multiple irritated responses on a ticket? You'll hear from Zia. She even identifies issues that get the most tickets, and helps you improve the strength of your Knowledge Base. 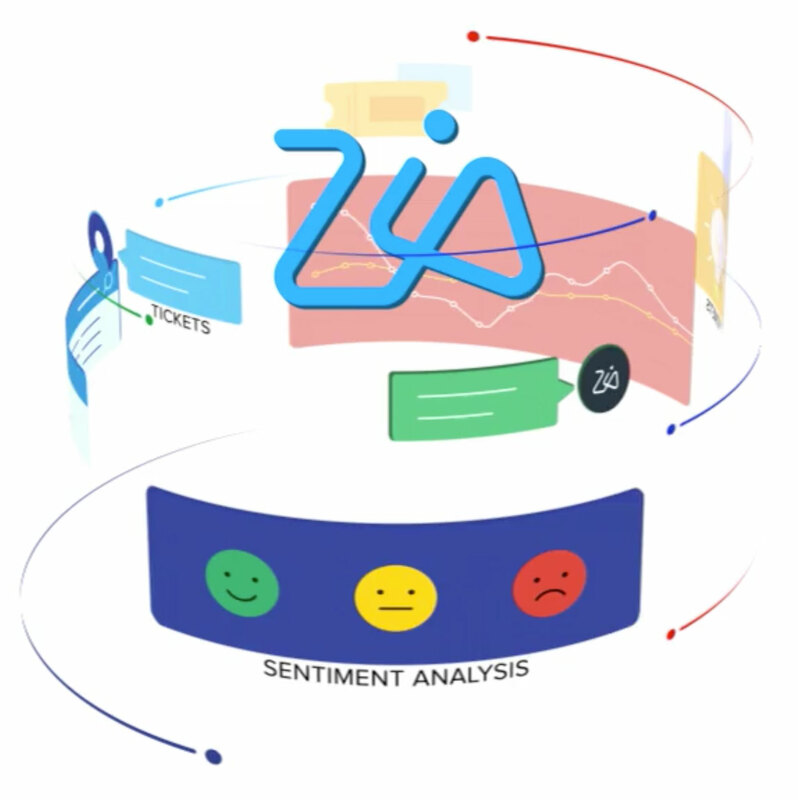 Zia brings together predictions across anomalies, sentiment, trending ticket tags, and more into a common dashboard for decision-makers to consume. 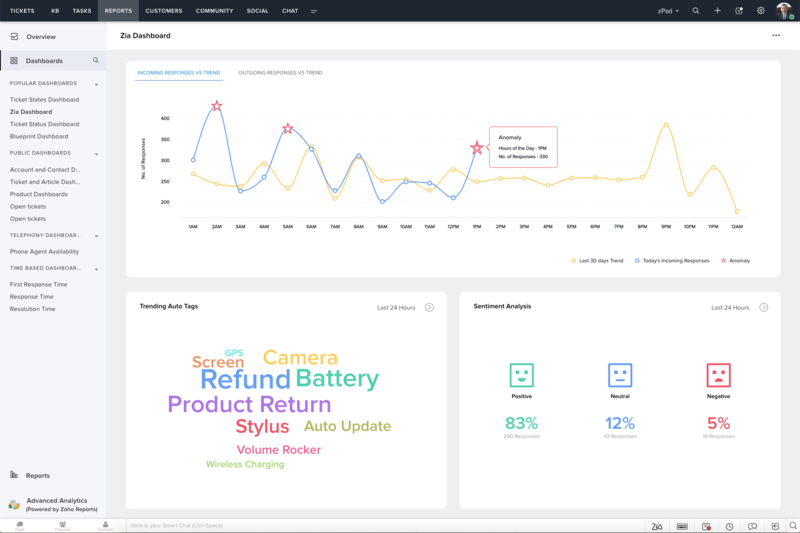 They can drill down further into the details from the same dashboard to investigate further. Teach Zia the skills you need. 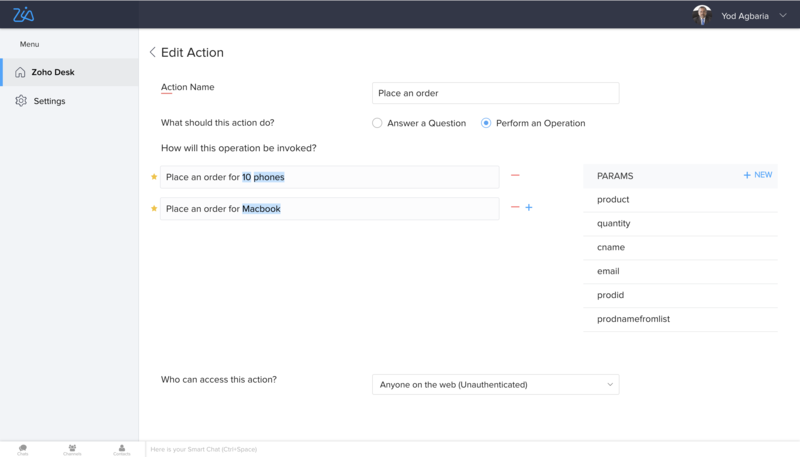 Through a Skill Builder interface, you can teach Zia to perform actions that are relevant to your customers. This could be placing or editing an order, checking order status, or just about anything else she needs to be familiar with. 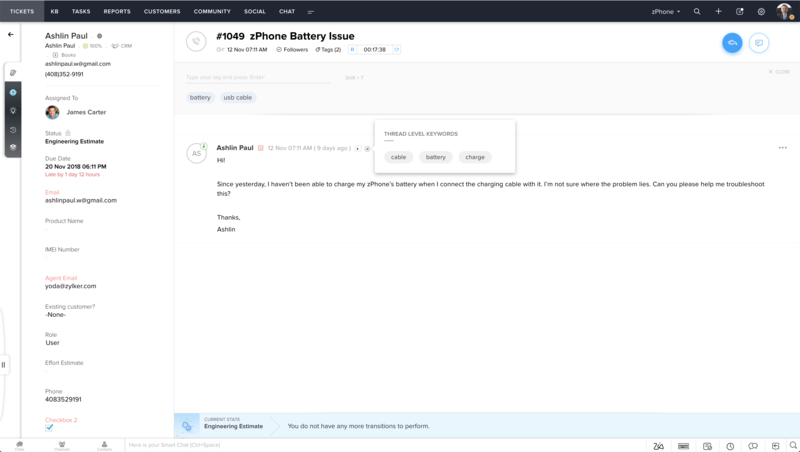 Supercharge your customer service with contextual AI.